Gucci slip-on loafer in GG velvet with leather trim. Heel designed to be worn folded down or up. "Mister" is made in Italy. Gucci leather loafer with brogue detailing. Convertible design allows the heel to be worn up or folded down. Single monk strap with king snake buckle. 1" flat heel. Apron toe. 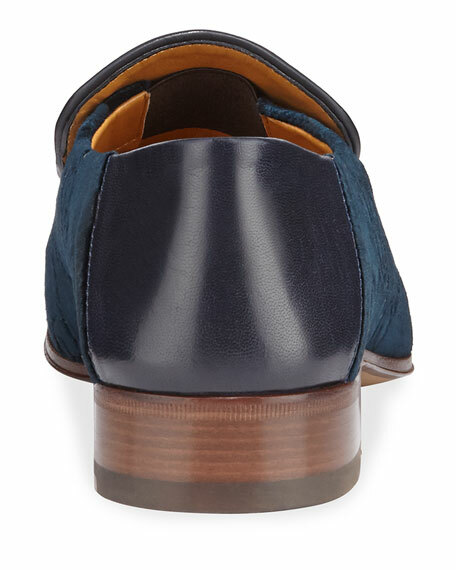 Sylvie Web grosgrain detail Leather outsole. "Plata" is made in Italy. Gucci leather slipper mules with signature green/red/green Web striping. Embroidered New York Yankees?? NY logo at top. Slippers include an Original GG canvas pouch with the MLB?? label. 0.3" flat heel. Round toe. Interlocking GG stud at side. Slide style. Leather lining and sole. Made in Italy. Gucci Men's Fold-Down Velvet Loafers with NY Yankees? ?